I thought it would be nice to use My bloggings on this middle Wimbledon Sunday to not give My opinion, but to give My fans some insights into Me. This is a privileged guide for you. I believe we should never make pre-assumptions so let’s start with the basics. Psychology is the study of the head (the part under the hair). Why have I been such a great champion? There are so many reasons I hear you say. And this is true, I agree with you. But let Me share some little fun tricks and insights with you that contributed to My standing out from the Little Guys. 1. The first trick I like to share is the Sociable Psychology. I recommend you, as and up and coming player, to not mix with the other players throughout your career. Especially the Little Guys. If you represent your country in the Olympic games do not stay at the Olympic villages for example. Rent a humble house for you and your staff. If the players organise a party times, do not attend. Make your own parties with close friends such as Tigers that live in the Woods, or Gwen VeryFunny. These parties can be just as fun! If the other players organise little events like soccer matches, do not attend. You may get injured and if you carry this into a tournament you may need to call the trainer during a match. And you always need to avoid this because you know what Tommy Haas gets like when this happens. – So, why do this? I will tell you the secrets. This gives you something special called the “Perceptions Effect”. It means when they do see you, you become the reality of the mystical figures. Suddenly you are standing in nice cardigans across the net from them. For them it is like they are meeting Harold Potter. Already you have the big advantage! 2. Change racquets during a set. Do this as the opponent is about to serve and you want to break him. Such as 4-4 or 4-3. the Perceptions Effect here is that they think you will have a very BIG tennis racquets! But guess what? This is very funnies. It is not true! 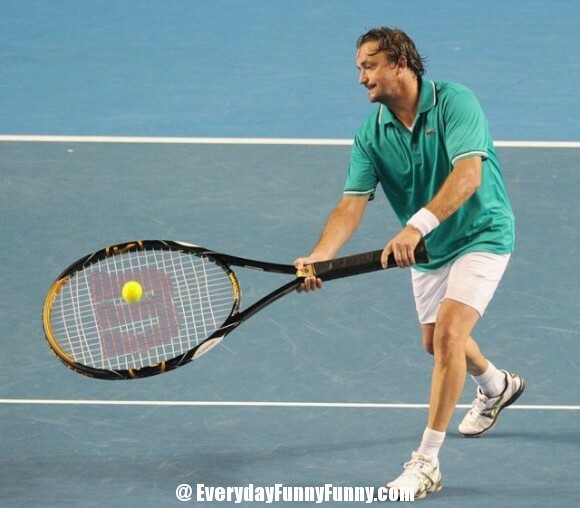 Your racquet is actually the same size!!!!! Again you have a big advantage as they are about to serve! Here is everybody’s friend Henry The Count making demonstrations. Here you need to make best friends forever (BFFF) with the people of the influences. Find out who they are and grace them with humble interviews about yourself. This, rightly, also makes them feel like they have been in the presence of Harold Potter. – Why do this? Because this means you can shout “Shut Up” to fans and other players’ families yet still be called humble. This is not the magic effect but the Humble Effect and you should never make the under estimations of this. However, this can have the effect of the opposites and they may become like stalkers. I often get text messages on My FedBerry from somebody that shall remain nameless whose name rhymes with Blue Darker. The message is “COME ON MY GOAT”. I don’t mind, but it can be off putting during a match when I want to do courtside tweetings to My fans. There we have it My fans. An insiders guide to Me. You’re welcome. – Signal Fraud – he was great but had personal issues I think, so don’t read too much otherwise you’ll never look at your mother in the same way again. – Ivan Karlovic Pavlov – he was very clever but makes you feel hungry so make sure your Chef is nearby. Now we can look forward to My last week with Mr. Wimbledon. The final should be exciting! I hope to see you there! Have You already made (or have Your staff make) BFFF’s with the people operating Hawkeye? I have heard this person Malisse is a self declared cheater on court (he said so in Rosmalen, a little town in the Netherlands, which is my favourite part of Germany actually). Personally I think Mr. Wimbledon should not even let him be under Your roof. I hope Rufus the real Hawk has told his electronical friend about Your Tweet to find him. If ever someone deserves to be BFFF’s with Hawkeye for the rest of his life, than it has to be You. Confidently looking forward to Your challenging linesmen’s calls today over and over again! PS: You not mixing with Little People, does that automatically mean You would never fulfill my dream of mixing with You, since I am only 5ft1? So many questions Heidi fan. You’re correct, I do have the issues with the Hawkeyes because I can never make the right guesses. Your height is fine. I am not a heightist person. Apart from Karlovic, too tall. I am making the blushings because You obviously took the time to answer me from Your locker suite or even court side. In case Hawkeyes is still not on Your side today I will petition for Rufus to be fired, because it will prove he doesn’t have the right birdlike connections and he wasn’t worthy of Your help after all. Or maybe You could tell Mr. Wimbledon to permanently close Your roof, so that Rufus will never ever be able to visit Your living room again (Strafe muss sein!). And thank You for helping me with my hight issues. Means a lot to me, coming from the GOAT.